24 cm tall (9.5 inches). Base diameter 16 cm (6 inches). Figurine Width 21 cm. 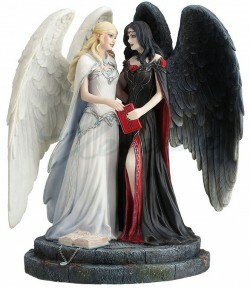 An Angel of the Light and an Angel of Darkness standing together both holding an ancient magical book. Each figurine is individually numbered.